Flowers are not a commonly featured subject in my work, and while I don't anticipate making them a fixture of my future portfolio anytime soon, I thought it might be nice to make them a subject of a picture or two. I have had very little experience depicting them flowers in any form, I looked at this situation as an opportunity to branch out a bit and experiment. A little research revealed that many of my favorite artists had tackled the subject, with widely varying techniques and approaches. I envisioned doing several paintings, one looser and more expressive, the latter tighter and more formal. I decided to work on the more experimental picture first. 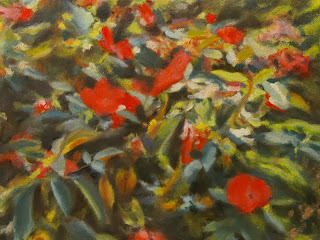 This picture was based on a visit to the Brooklyn Botanic Garden, and was a combination of real visits and studio work. This picture came out very different than I expected, and I may work on it a bit more in the future. 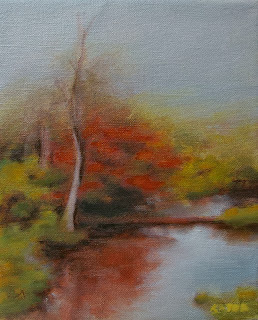 It did teach me a lot of things that turned out to be valuable in the more formal painting that I completed later on.